The disciple walked up to the lake. When he reached it, he noticed that right at that moment, a bullock cart started crossing through the lake. As a result, the water became very muddy, very turbid. 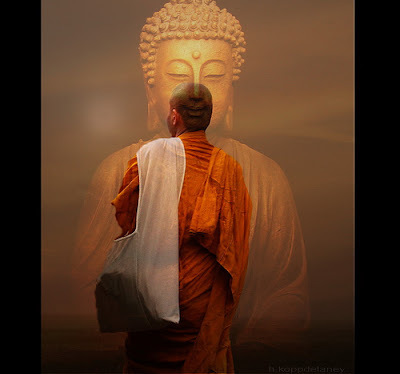 The disciple thought, “How can I give this muddy water to Buddha to drink!” So he came back and told Buddha, “The water in there is very muddy. I don’t think it is fit to drink.” After about half an hour, again Buddha asked the same disciple to go back to the lake and get him some water to drink. The disciple obediently went back to the lake. This time too he found that the lake was muddy. He returned and informed Buddha about the same. After sometime, again Buddha asked the same disciple to go back. The disciple reached the lake to find the lake absolutely clean and clear with pure water in it. The mud had settled down and the water above it looked fit to be had.. So he collected some water in a pot and brought it to Buddha. Buddha looked at the water, and then he looked up at the disciple and said,“See what you did to make the water clean. You let it be…. and the mud settled down on its own – and you got clear water. Your mind is also like that! When it is disturbed, just let it be. Give it a little time. It will settle down on its own. You don’t have to put in any effort to calm it down. It will happen. It is effortless.” What did Buddha emphasize here? He said, “It is effortless.” Having ‘Peace of Mind’ is not a strenuous job; it is an effortless process! This is a very blissful story with lessons of STRENGTH....COURAGE to pursue....have loads of PATIENCE..... In life everything goes on... Keep Going. Have a peaceful Life! KEEP SMILING not because of something but in spite of everything.